Typical cold and windy conditions greeted the participants at the 49th annual Knights of Columbus Relays, held Saturday at Conley Stadium. 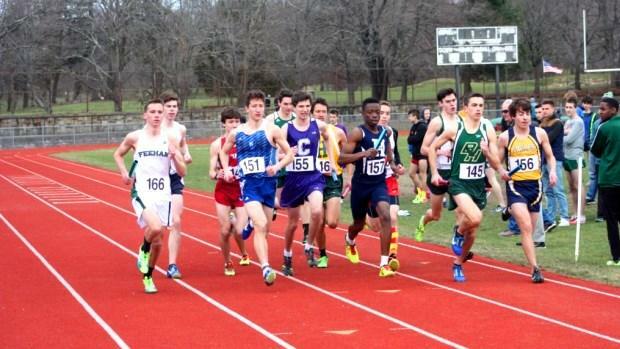 The Bishop Hendricken boys and Portsmouth High girls posted the fastest times in the featured 4xMile event. The Hawks' foursome of Joseph Dargin, Jon Imarone, Sean Meehan and Jeff Venter combined for a time of 18 minutes, 59.2 seconds. La Salle was second at 19.03.1. The quickest time of the day belonged to La Salle's Joseph Dos Reis, who clocked 4:33 for his leg. In the hammer competition, the state's top two throwers won their respective divisions. Woonsocket's Jared Briere had a winning heave and an early-season nation No. 1 of 205 feet, 2 inches for the boys' title. The Villa Novans swept the next two places with Dilyn Cote taking second (192-8) and Jacob Greenless securing third (192-0). West Warwick's IVan Goretoy (191-6) and Classical's Jacob Furland (191-2) also surpassed 190 feet. Ponaganset's Gianna Rao claimed the girls' crown with a distance of 166-9. Barrington's Faith Polombo was second with a distance of 162-3 and Toll Gate's Ani Armenakya placed third at 160-3. Rao's toss currently ranks No. 2 in the country. The Freshmen Mile races were captured by La Salle's Jack Wilbur and Smiithfield's Ashlyn Maio. Wilbur crossed the line in 4:53.6 in the boys' race, a few strides ahead of runner-up Matt St. Jean of Hendricken, who was timed in 4:54.0. Hendricken's David DelBonis was third at 5:01.0. Maio took the girls at 5:39.7. Placing second was East Greenwich's Bryn Shunney (5:44.1) and third was Smithfield's Ana Logan (6:08.6).